WASHINGTON – The sun is about to flip its magnetic field, at the peak of its 11-year solar cycle or at the half-way point of what scientists call a solar maximum – when it is at its most violent in terms of solar flares and the Earth is most vulnerable to an electromagnetic pulse. This mid-way point is expected in about four months – a December/January time frame – putting Earth in a position of greatest vulnerability even as the solar maximum diminishes well into 2014. A solar flare drowned out radio communications on Earth on February 2. The relatively “tiny” sun spot erupted into a moderately sized Class-C coronal mass ejection. The sound of the waves created by the solar flare cloaked radio waves between 28MHz and 21.1 MHz. The voices going across the impacted radio signals appeared to be “swallowed” by the solar flare, Wired notes. NASA JOVE project radio astronomer Thomas Ashcraft noted how interesting the sound was as the wave from the coronal mass ejection (CME) rolled through. SOLAR WATCH: Monster Sunspot 1654 Aims Our Way – Earthquake Window Opening As Coronal Mass Ejections To Hit Earth On Thursday! 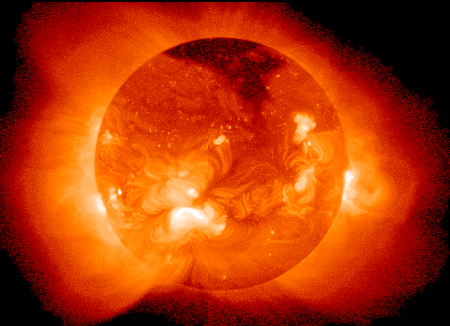 January 15, 2013 – THE SUN – Simulations of a coronal mass ejection (CME) show the impact arrival of such on January 17th. This coincides with Senior Meteorologist Kevin Martin’s window for an earthquake in North America. The Sun is acting up again, with large sunspots moving across the solar disk. The sunspots are powerful enough for x-class solar flares, the most powerful of them all. Image: The Weather Space Network.